In your work you rely on having suppliers who use the best equipment to complete your jobs. Among the most important pieces of equipment required for oil drilling and completions are power tongs. 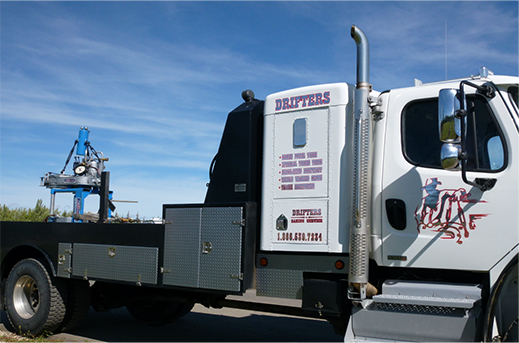 Drifters Casing Service is a local provider of power tongs services in Grande Prairie and Whitecourt areas with a reputation for expertise and reliability. Eckel. Eckel is the one of the world’s leading power tong manufacturers. Each Eckel tong must pass a comprehensive compliance checklist so it’s ready to meet requirements in the field. Farr. You can count on the high performance ratings of Farr power tongs. Universe. Since 1965, Universe Machine Corporation has supplied trustworthy steel products for the oilfield industry. Their quality standard system ensures that each power tong meets your application requirements. We have many sizes of power tongs to fit the size of your pipe, from 2-3/8″ to 13- 3/8″. And our power tongs equipment offers a wide torque range to suit the job. In addition to power tongs in Grande Prairie, we provide all other casing and tubing services you may need, including integral tubing tongs. You can also monitor your equipment with WinCatt Computer Torque Monitoring that we can provide and monitor on your behalf. All equipment can be used in drilling and completions work. We’re your provider of oil field drilling and completions services that require power tongs and related oilfield equipment. Since 2000, our locally-owned and operated company has helped companies like yours get the work done right. Contact us for more information.